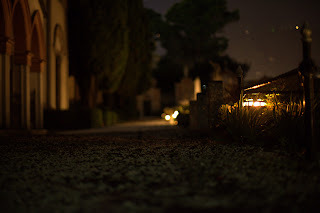 At midnight, in the rain, still bubbling with the excitement of having a beautiful camera to play with, I decided that a walled cemetery / morsoleum would make the perfect spot for a little 'photo essay' darling! With Neeks on Guard, I broke in and snapped away. I'm an absolute genius. With the full auto mode and a killer lens, everyone's a genius.